New 8 Bit Pony – You Gotta Share. FYI, the media section on the site isn’t being updated at the moment, we’ve had a fair share of new videos and such over the past week, but currently we have an awesome brony who is recoding the site. If you deal with web pages and never looked at the site’s source, well, its tablerific. The new site will look the same, but will be coded in php. Its also given us (or well the germany brony) a chance to find errors and mistakes that I may have made over the months. I had planned on debugging the place after the season ends, but might as well do it while the house of Derp is rebuilt. So after the page update, the media section will be updated with what we’re missing at the moment. Was checking around to see what was going on in the world of ponies, and I see the BigPonyMac who was featured over in EqD is working on other projects besides Fluttershy. You can check out BigPonyMac over on dA, including updates on their work with the Fluttershy sculpture and any other pieces of work being made. 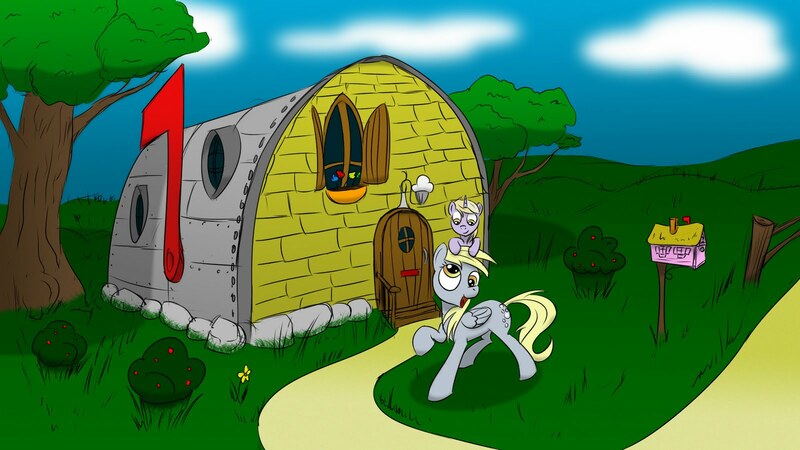 Random find while on my treasure hunt for pictures in Ponibooru, Derpy and Dinky and their home. Who can’t love it, a mailbox for a house (and a house for a mailbox). Man those guys are just plugging away, but as always I’ll send you over to EquestriaGaming for the full write up. Today seems to be showing off their character scripting along with other features add. I must admit these guys work hard, as I hang out in the IRC chatroom they have for the project, seems like they’re always plugging away at it. In other news, still waiting on the HD version of the last episode, at least via Mentos’ google doc, “Still waiting on raws”. I’ll post them up when they appear.